In this video we will discuss, how to implement search in Angular using search filter. As we type in the search textbox, all the columns in the table must be searched and only the matching rows should be displayed. 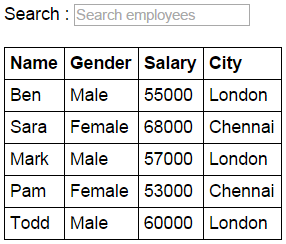 Search : <input type="text" placeholder="Search employees"
At the moment, the search is being done across all columns. If you want to search only one specific column, then change ng-model directive value on the search textbox as shown below. With this change only city column is searched. Hi the above e.g is not working when i enter male in search text . Hello sir, when i enter Male in search text it is not working, request you to assist us for the same. It is working with MALE also, but you are not able to see the changes. Because all rows having "MALE" word (male and female both having MALE word), so when you type MALE all rows are valid and showing(Means,It's seems Nothing changing but it is valid). we've additional column which contains date, when we search for character 'g' or 'w' then the proper result is not display in the table. it also shows the result which not contain the character 'g' or 'w'. hi this anil you are saying correct because the two words consists of both male and female the common is male it search properly but it does not excepted output as the end user excepted how it customization.